The year 2017 was the hottest year on record, as the image below illustrates. 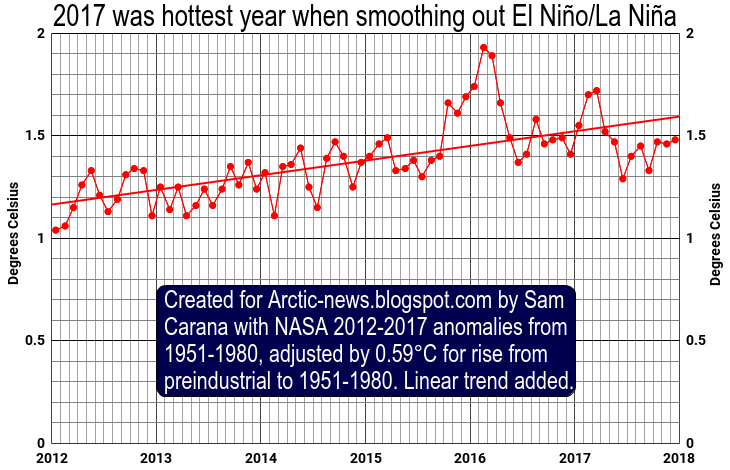 When determining which year was the hottest year, care should be taken to avoid bias due to temporary conditions such as the El Niño that was present in 2016 and the La Niña we're now experiencing now. 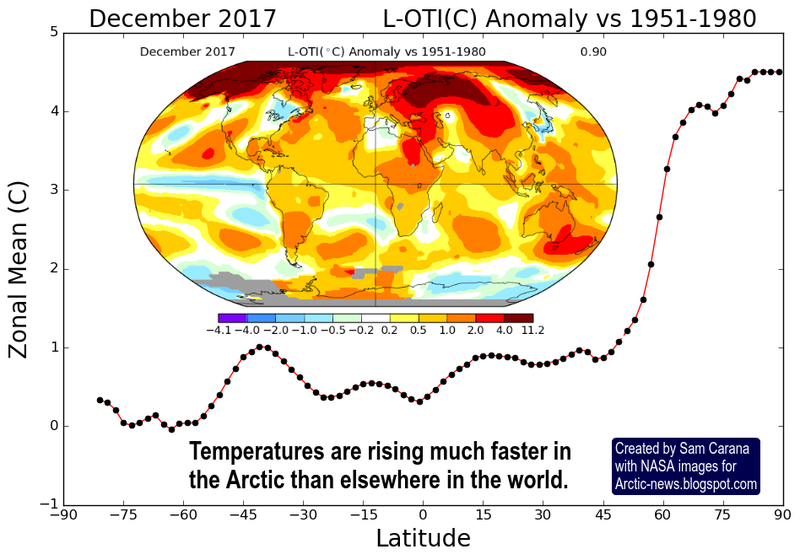 Above image uses NASA land+ocean January 2012-December 2017 anomalies from 1951-1980, adjusted by 0.59°C to cater for the rise from preindustrial to 1951-1980, to calculate a linear trend that goes some way to smooth out variability due to El Niño/La Niña events. The trend shows that 2017 was significantly warmer than 2016. The trend also shows that 1.5°C above preindustrial was crossed back in 2016. 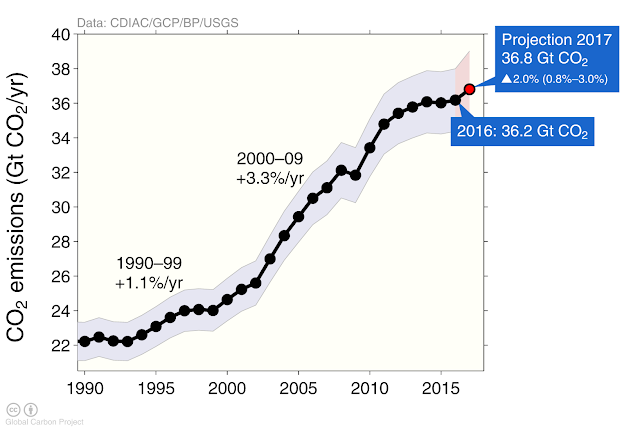 This 1.5°C (or 2.7°F) was set at the Paris Agreement as a guardrail that was not to be crossed. The trend further shows that we've meanwhile crossed 1.6°C above preindustrial and we look set to cross the 2°C guardrail within years. 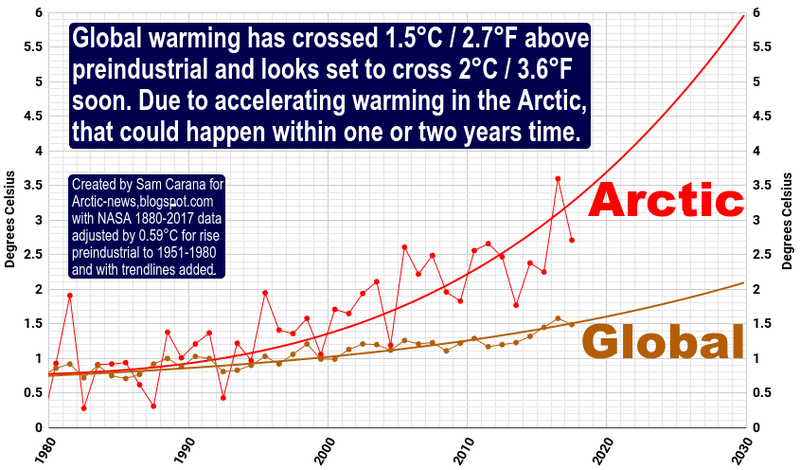 Global warming has crossed 1.5°C / 2.7°F above preindustrial and looks set to cross 2°C / 3.6°F soon. 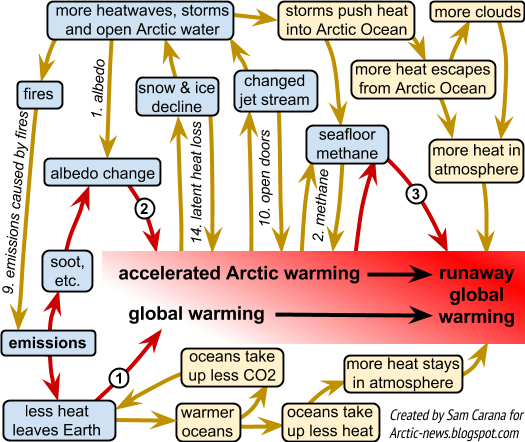 Due to accelerating warming in the Arctic, that could happen within one or two years time, i.e. much faster than the trendlines below may suggest. In conclusion, feedbacks could speed up global warming by much more than what may be suggested by above trends that look only at surface temperature of the atmosphere and that are based on previous data when such feedbacks had yet to become manifest. 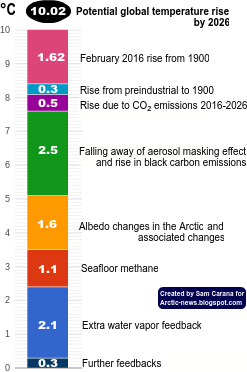 Add up the impact of all warming elements and, as an earlier analysis shows, the rise in mean global temperatures from preindustrial could be more than 10°C in a matter of years, as illustrated by the image below, which shows a much steeper rise. Particularly devastating feedbacks could result from changes regarding heat and carbon dioxide taken up by oceans. Oceans now take up 93.4% of global warming, as illustrated by the image below. As said, when looking at surface temperatures of the atmosphere, there will be bias due to El Niño/La Niña events. One way to smooth out such bias is by calculating trendlines over many years. Another way to compensate for such bias is to also look at ocean heat. In terms of ocean heat, the year 2017 stands at the top, as the left panel of above image illustrates. In 2016, El Niño caused relatively more heat to be present in the atmosphere and less in oceans, whereas the opposite occurred in 2017, contributing to the fact that in 2017 a record amount of ocean heat was recorded. Occurrence of El Niño/La Niña events over the years is visualized by the image below. One danger is that, in future, there will be more impact by El Niño events and less by La Niña events. A recent study concludes that as temperatures rise due to emissions by people, the frequency, magnitude and duration of strong El Niño events will increase. In addition to higher temperature peaks due to El Niño events, more heat could remain in the atmosphere as the rise in temperature in general causes greater ocean stratification, making that less heat gets absorbed by oceans, as discussed in several earlier posts. The image below depicts this feedback and further feedbacks mentioned above. Feedbacks are described in more detail at the feedbacks page. 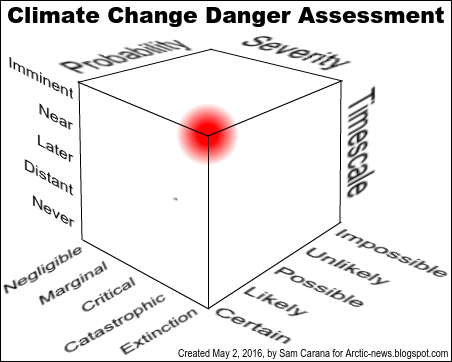 The situation is further illustrated by the danger assessment below. Meanwhile, the Global Carbon Project projects a growth of 2% for the 2017 global carbon dioxide emissions from fossil fuels and industry (including cement production), compared to 2016 levels, as illustrated by image below. 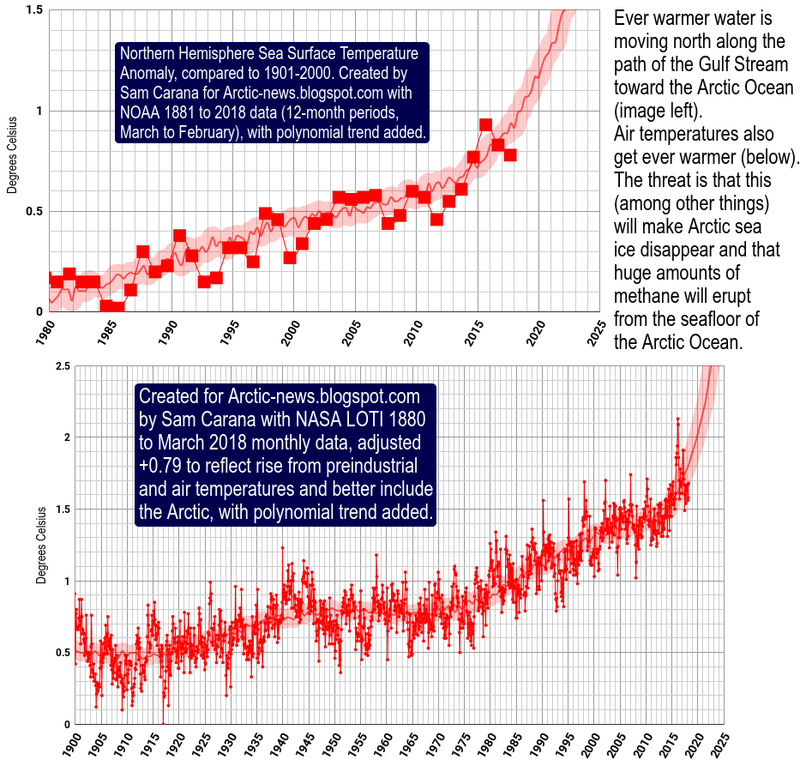 • 10°C or 18°F warmer by 2021? 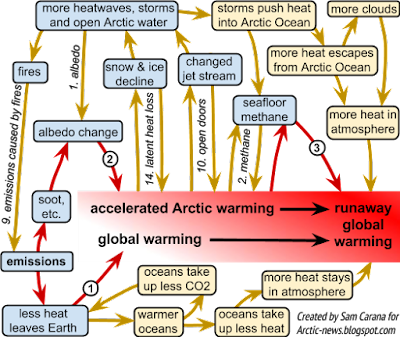 • Abrupt Warming - How Much And How Fast?